Cadillac was once the standard of the car world, but a couple decades of missteps, like the '80s Cimarron and '90s Catera (Opel or Vauxhall Omega for those in Europe), sent luxury buyers to more refined European automobiles. But Cadillac sought to fix its reputation of being the car of choice for your grandparents with sharp styling and European refinement. The start of Cadillac's renaissance began with the debut of its art and science design language on the 2003 CTS that continues to this day. Art and science also brought us one of my favorite modern Cadillacs – the CTS-V wagon. However, the CTS is a bit big and Cadillac needed a car that can compete with the bread-and-butter Audi A4, BMW 3-series and Mercedes C-class, thus the ATS was born for the 2013 model year. 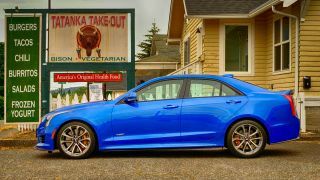 But having a small car wasn't enough, so Cadillac injected the ATS with a double dose of testosterone to unleash the ATS-V – America's finest sports sedan ready to take on the Audi RS4, BMW M3 and Mercedes C63 AMG. To find out if the ATS-V has the chops to take on the Germans, I spent a week in a sedan with an MSRP of $75,900 (not available in the UK or Australia yet) that includes the carbon fiber and luxury packages, navigation, Recaro performance seats, sunroof, performance data recorder and a couple aesthetic touches. I loaded it up with a pair of child seats and attempted to stay out of trouble, at the behest of my two girls telling me to, "Go zoom-zoom, daddy!" I absolutely love the sharp lines of the ATS-V. It's a striking car that cannot be mistaken for anything other than a Cadillac. But it isn't the Cadillac driven by retirees, either. There's a real carbon fiber front splitter, rear diffuser and hood vent – not the cheesy chrome you're used to seeing on grandma's Eldorado. The grille mesh Cadillac employs on the sportier V-series gives the ATS-V a classy touch to its in-your-face schnoz. Around back, the ATS-V has thin and tall tail lights that reminds me of the '90s Deville, but much sexier and loaded with LEDs. Step inside and the ATS-V treats you to an interior with plenty of soft touch surfaces, Alcantara and carbon fiber trim. As much as I love the look and feel of the Alcantara-wrapped wheel, it's quite slippery and makes you yearn for driving gloves just to get a grip. Cadillac continues down the rabbit hole of high-gloss, piano-black trim on the most frequently touched surfaces, like the center stack and steering wheel controls. I hate high-gloss interior trim because it's impossible to keep clean and not the best for that occasional cruise through the Burger King drive-through for some Mac n 'Cheetos. The climate control panel consists of capacitive touch buttons, which I despise. The ATS-V has haptic feedback that provides gentle vibrations when you successfully press the button. While Cadillac installs a metal lip to help with muscle memory, it's just not the same as physical buttons that click. Nevertheless, I got used to it during my week with the ATS-V. It's not ideal, but I'm the type of driver that sets the temperature to the automatic climate control and never touches it again. The only capacitive touch button I had to press somewhat frequently was for the heated seats, which doesn't require much precision. The volume control is on the capacitive touch panel, too, but I stick to using the steering wheel controls. Cadillac employs standard clicking buttons for steering wheel controls, fortunately. Cadillac user experience (CUE) relies purely on a capacitive touchscreen, unlike the control knobs or touch pads used by competitors, like Audi, BMW, Genesis, Infiniti, Lexus and Mercedes-Benz. The native user interface resembles that of other GM vehicles, but with a more responsive touchscreen and crisper graphics. The user interface is quite intuitive to use, but it lacks a split-screen display that shows your music information and navigation maps like Toyota, Hyundai, Kia and the luxury brands. CUE feels like an infotainment system designed for a mainstream vehicle, but gussied to work in a luxury car – it's not terrible, but feels out of place in a Cadillac. However, CUE supports Android Auto and Apple CarPlay, which forgoes the Cadillac UI for a familiar smartphone-powered UI. Plug-in your Android phone or iPhone and be on your way – just don't expect compatibility with Pokémon Go. I didn't encounter any compatibility problems with my Nexus 6 or iPhone 6S, but I prefer Android Auto because Google continues to own my life. A quick touch of the metal strip at the bottom of the capacitive touch panel reveals a hidden storage cubby. It fit my iPhone 6S perfectly, but my Nexus 6 was too big. There's a USB port in the cubby so you can plug your phone or other USB devices, too. Qi and Powermat wireless charging is available inside the cubby, but once again, my Nexus 6 was too giant to take advantage of the charging pad. Smaller devices like the Samsung Galaxy S7 should fit without any issues, but you can't physically wirelessly charge and use Android Auto at the same time, which renders the wireless charger useless if you intend to rely on Android Auto. Check off the Performance Data Recorder (PDR) option for $1,300 (£987 or AU$1738) and you get an integrated video camera that records your track day or driving shenanigans. The PDR is mounted at the top center of the ATS-V windshield, hidden in front of the rear view mirror. It integrates with the CUE infotainment system and has an SD card slot in the glove box. The PDR only supports SDHC cards up to 32GB, which I had trouble finding around my house because SDXC cards are so cheap nowadays. Resolution of the PDR is quite low at a paltry 720p, but it's more than a one-trick pony, like a GoPro. The PDR lets you overlay driving data, like the vehicle speed, tachometer, performance data, track time and throttle information, directly onto the video file. The idea is you can save your laps for later evaluation to become faster around the track. There's a companion app from Cosworth that lets you analyze your lap times in detail. I wasn't able to put the ATS-V on the track so the PDR was tested driving around town, which is quite uneventful. It serves double duty as a dash cam when the car is in valet mode, so you can ensure your valet driver isn't channeling his inner Ken Block while in possession of your ATS-V. Since the V-series is Cadillac's performance series vehicle, the ATS-V gets the full performance car treatment, which includes a twin turbo 3.6-liter V6 engine and suspension upgrades to match. The V6 puts out a tire-shredding 464 horsepower (hp) with 445 pound-feet (lb.-ft.) of torque for a fast 0-60 mph time of 3.8-seconds. All that power is sent to the rear wheels via a 6-speed manual transmission, though an 8-speed automatic is optional if maneuvering three pedals isn't your thing. The 6-speed manual transmission features automatic rev-matching, but you have to turn it on every time you start the car via steering wheel-mounted paddle. Automatic rev-matching makes downshifting quicker and easier. Instead of rev-matching by blipping the throttle before letting off the clutch while down-shifting, automatic rev-matching does it for you perfectly every time. GM's Magnetic Ride Control (MRC) suspension system is standard on the ATS-V. It's a delightful adaptive suspension system that automatically stiffens up when you're aggressively cornering and softens up for daily cruising through potholes. Altogether, the ATS-V is a harmonious balance of power and handling that's a perfect wake-up call. Who needs coffee when you have 464 horses channeled through a glorious sounding exhaust that really gets the adrenaline pumping. There's a lot to like about the Cadillac ATS-V. Despite the CUE infotainment system's early iterations not being very good, Android Auto and Apple CarPlay support improves the experience because the capacitive touch screen is designed for the projected smartphone user interface. The PDR is an expensive option at $1,300, but it delivers capabilities unavailable if you're just slapping a GoPro into the car. It may only record at 720p, but the vehicle information overlay and Cosworth companion app lets you learn to improve your driving. However, if you're not racing the ATS-V, the PDR is only useful for recording car videos nobody will watch, or hopefully busting your valet trying to abuse your car. But, the PDR is pretty damn cool to have for bragging rights. The ATS-V is a pleasure to drive. The twin turbo V6 delivers German levels of refinement in daily driving and opens up when you really hammer on it. Cadillac's magnetic ride control suspension is comfortable, but able to stiffen up when you're ready to tackle those windy back roads. Automatic rev-matching is an awesome use of technology to simplify and sweeten the driving experience. Sure I can rev-match myself, but when I'm stuck in traffic or focused on passing someone, it's one less thing I have to think about. My only annoyance is you have to manually turn it on each time you start the car. Cadillac continues to stick to the capacitive touch panel, which isn't as easy to use as physical buttons. It's distracting to have to look before touching a button – there's simply no way to train your muscle memory to operate the buttons. I didn't have to use the buttons as much during my week with it, but I'd much prefer old-fashioned clicky buttons. The capacitive touch panel also comes with gratuitous use of glossy piano-black trim, which reveals every single smudge and fingerprint. Unless you're constantly wiping down all the surfaces, it's hard to keep clean, which I find extremely annoying. Cadillac faces tough competition with the ATS-V from the likes of the BMW M3 and Mercedes-Benz C63 AMG. Audi, Jaguar, Lexus and Infiniti offer sportier versions of the S4, XE, IS350 and Q50s, but they're more comparable to the regular ATS V6, not the V-series. The BMW M3 and Mercedes-Benz C63 AMG are tough to beat, but the C63 is strictly a two-pedal affair and I like my performance sedans with three pedals. You can't go wrong with the BMW M3, but it lacks Android Auto and Apple CarPlay support. However, the BMW M3 is better looking to me and has a less distracting, driving-focused interior. If you don't need Android Auto or Apple CarPlay support, the M3 would be my pick, but the ATS-V is a close second. Cadillac's latest compact car has redeemed it from the '80's Cimarron, which was based on the plebeian J-body Chevrolet Cavalier. It's a fun car to drive that delivers what a driving enthusiast wants, but the glossy interior panels and distracting capacitive touch buttons are annoyances that you have to live with daily. Android Auto and Apple CarPlay support make the annoyances more tolerable, but for the same price, I'd rather go with the BMW M4 for its interior, or wait for the next-generation Audi S4 with the slick virtual cockpit, like the Audi TT.